This is one of the most elegant of our wreaths for Christmas. It�s a time-tested holiday favorite. 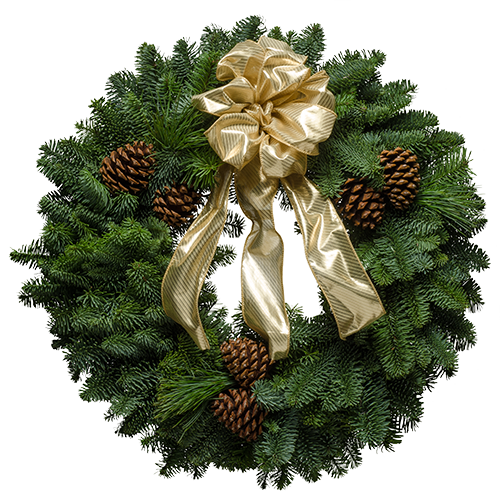 The gorgeous fresh Christmas wreaths feature yards of silky gold colored ribbon that bring class to your front door. You�ll simply love the tantalizing evergreen scent found in every wreath we create. That bouquet of pine and fir is the delicate aroma of the forest and you can share that with all of your gift recipients too. The folks at Everyday Health cite a study that reports we can detect one trillion different smells. Here at Christmas Forest, we put the earthy smell of fresh cut evergreens right at the top of pleasurable aromas. Order these charming wreaths for Christmas for everyone on your gift list. Our customers tell us that they wait all year for that moment when they open their package from Christmas Forest. They even say that it isn�t Christmas until their Christmas wreaths arrive. Order 10 or more fresh wreaths for a 10% quantity discount. "People just love to get their Christmas Forest wreaths. Even their friends look forward to getting them. Thanks a lot and Merry Christmas to all at the Forest."